Unicorns are pretty awesome! So are Sasquatch, the Minotaur and all sorts of other mythical creatures--magical, powerful and hard to find. I know kids love reading fantasy series, yet when it comes to recommending books for developing readers there just aren't many fantastic fantasy series out there. Adam Gidwitz's new series Unicorn Rescue Society is perfectly aimed at readers transitioning from short chapter books and moving up toward longer stories. Hand this to kids who have read all the Magic Tree House and Secrets of Droon books but aren't quite ready for Percy Jackson or Harry Potter. Elliot's first day at a new school turns out to be full of adventure. Chapter One opens as Elliot stares down the long aisle of the school bus. It's his first day of school, and his class is taking a field trip. Gidwitz brings the reader right into this uncomfortable situation, as Elliot struggles to make a new friend. While I totally relate to Elliot, I love Uchenna -- the Nigerian American girl who befriends Elliot. Uchenna looks "like the lead singer in a punk rock band." She's got style, confidence and a sense of adventure. Before we even find out where Elliot and Uchenna's class is going on their field trip, we meet their teacher Miss Vole and their special guest, the intimidating and mysterious Professor Fauna. He informs the class that they will be going to the Pine Barrens of New Jersey, where many dangerous things haunt the forrest. When they get to the Pine Barrens, Uchenna wanders off the path to investigate a noise she hears. 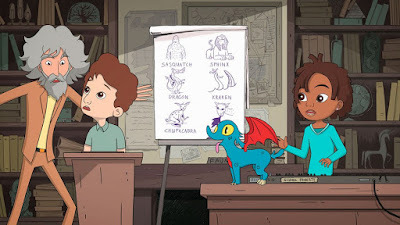 Elliot follows, and they discover a blue-furred magical creature that looks like “a tiny dragon.” This creature, the mythical Jersey Devil, takes an immediate liking to the pair, following them back to the school bus. A hide-and-seek chase ensues as Elliot and Uchenna try to protect the Jersey Devil. 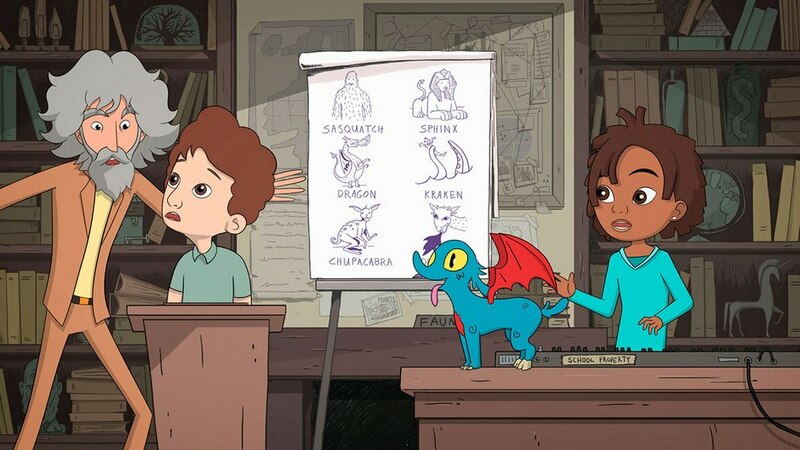 The book closes as Professor Fauna invites Uchenna and Elliot to join his secret organization that is committed to protecting mythical creatures. You'll have fun showing this video to kids, as Elliot and Uchenna explain what the Unicorn Rescue Society does. Gidwitz has hit a great balance between short, engaging chapters and a mystery that makes you want to learn more. Hatem Aly's illustrations keep readers grounded, helping them create the movie in their heads. The fantasy and humor elements are engaging, but never overwhelm the straight-forward storyline. 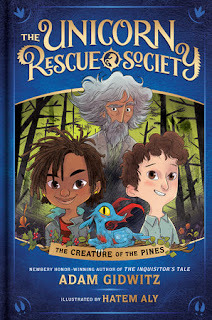 Hand this new series to 2nd & 3rd graders who have moved beyond Magic Treehouse, but still want a story that moves quickly. "Joseph Bruchac and I are writing about the Native American legend of Sasquatch. Emma Otheguy and I will travel to Cuba to rescue the madre de aguas. David Bowles and I will scour both banks of the Rio Grande to find, and protect, the chupacabras. And Hena Khan and I will write about the mythical creatures of Pakistan. These are the first members of The Unicorn Rescue Society." I love how intentionally inclusive Adam Gidwitz is with his storytelling. When I was at the launch for this book at the Brooklyn Public Library, a young Black girl asked Adam where he got the inspiration for creating the character of Uchenna. He explained that Uchenna and Eliot are based on students from his teaching days in Brooklyn. Uchenna was one of his students, and is now in college (I think). This representation matters to young people. It's no secret that I have loved Adam's writing since I first read A Tale Dark & Grimm, and my book club Skyped with him. Those kids are now in high school, and they still talk about how awesome that experience was. I want to end with Adam's mission statement, as it were, that he shared in the Nerdy Book Club post. "I’ve always believed that kids books should be ambitious. They should challenge children. Stretch their vocabularies. Or their courage. Stretch them emotionally and psychologically. Or stretch their imaginations. Maybe stretch their moral imaginations. But I have also always believed that ambition in kids books (in any book) is useless unless kids are actually reading the book. You can have the genius of James Joyce, but if you write like James Joyce, the kids will never get to experience your genius. The first priority is to get kids turning the pages. All the pages. All the way to the end. The second priority is to make it worth turning the pages. "The Unicorn Rescue Society is pretty darn fun. When I write it, I generally find myself cackling like an idiot. "But The Unicorn Rescue Society is also, I hope, worthwhile. "Oh, and we rescue unicorns." My job as a librarian isn't to share books I love, but to help kids discover books they like -- books that get them excited to read. Like Adam, I also believe that books have the potential to challenge, stretch and connect with kids. But I also know very clearly that this will never happen unless kids get hooked on a story, that they want to read the book in front of them. Illustration copyright ©2017 Hatem Aly and the Mixtape Club founders Jesse Casey and Chris Lenox Smith. The review copy was kindly sent by the publisher, Dutton Books for Young Readers / Penguin Publishing Group. If you make a purchase using the Amazon links on this site, a small portion goes to Great Kid Books. Thank you for your support. We love Adam Gidwitz in our library, too! He came for a visit a few years back to promote his Grimm series, and kids flocked to those AND original Grimm fairy tales like moths to a flame! Thanks for reminding me about his new series; must add it to my shopping cart for fall! This book sounds perfect for my son. I had not heard of this author before, so thank you for the review!